When I’m an old lady with a dozen little grandkids at my knees, this is what I will make for them. The original recipe is actually from someone’s grandma, so you know it’s good. I changed it ever so slightly and only because I didn’t have all the ingredients listed. 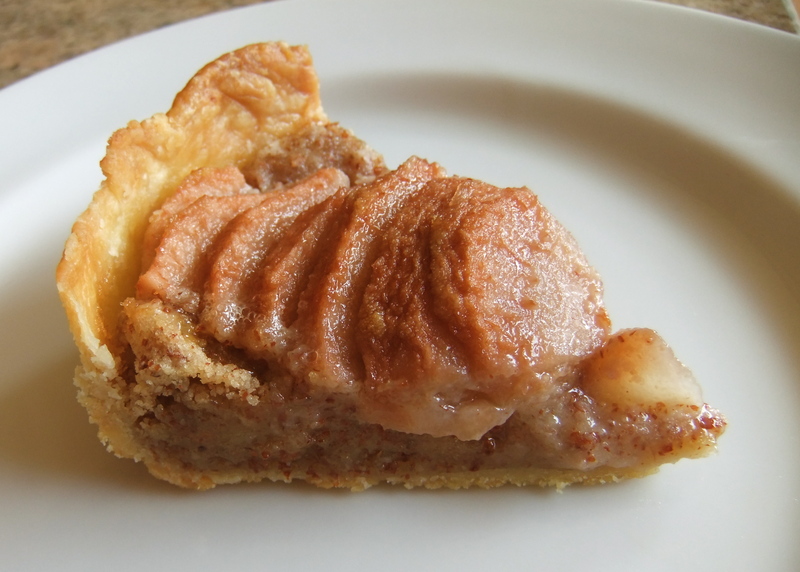 Normally I like to use my favorite sweet pastry crust recipe for pies, but in her post, Jules talks about the cookie-like crust and how it is really the star of the pie, so I went with hers. You know, I’m glad I did because the crust really is something special—it’s crumbly, crunchy and full of sugar and spice. 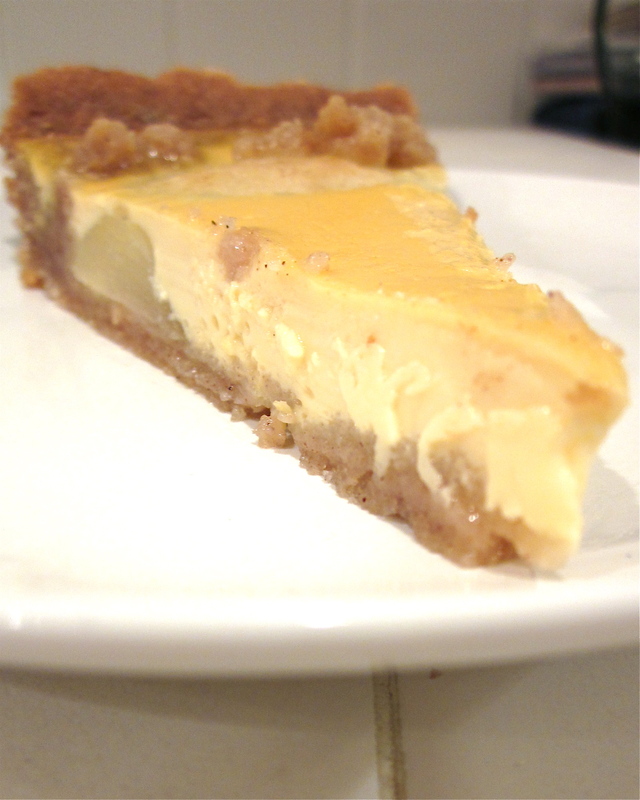 The custard is lovely too, not too sweet and tastes incredible in combination with the pears. Instead of the called for whipping cream, I used evaporated milk because that’s all I had. I don’t think it affected the flavor or texture very much. One thing about the pears: it’s important that they are soft. 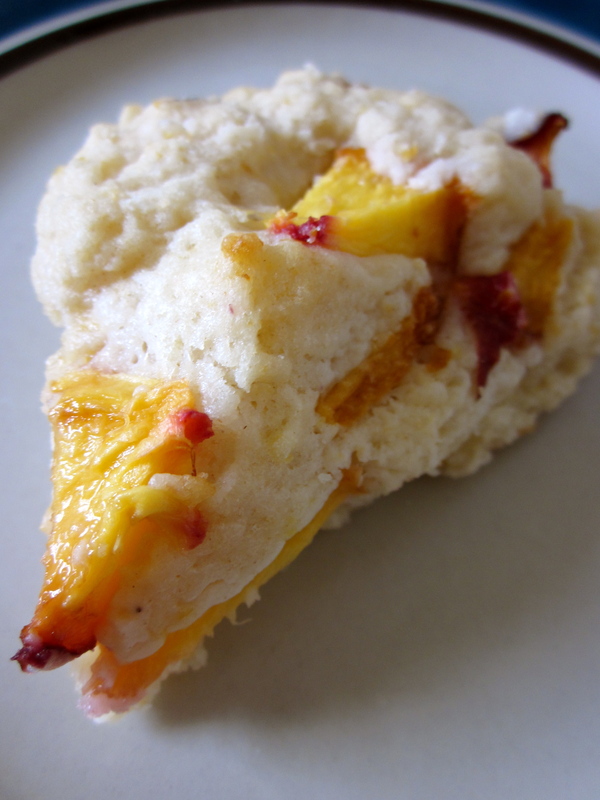 If you use canned, then you don’t have to worry, but if you use fresh, be sure to poach them first. I happened to have two fresh pears at home already, which is why as part of my prep, I peeled, halved and cored them and then poached them in water flavored with lemon juice and a little sugar until soft yet still firm. The original actually called for canned plums, which I’m sure would also taste amazing, as would perhaps apple and peach. Grandmas always make things with love, which I suspect is the real secret ingredient to this pie. So make it with a full heart and share it with the ones you love. Pre-heat oven to 375 F. Cream the butter and sugar together in a large mixing bowl. In a separate, smaller bowl, mix together flour, salt, cinnamon, nutmeg and baking powder. Add dry mixture to the creamed butter and sugar and blend together. Reserve one-third for later use. Press the remaining dough mix into a 9-inch tart or springform pan. 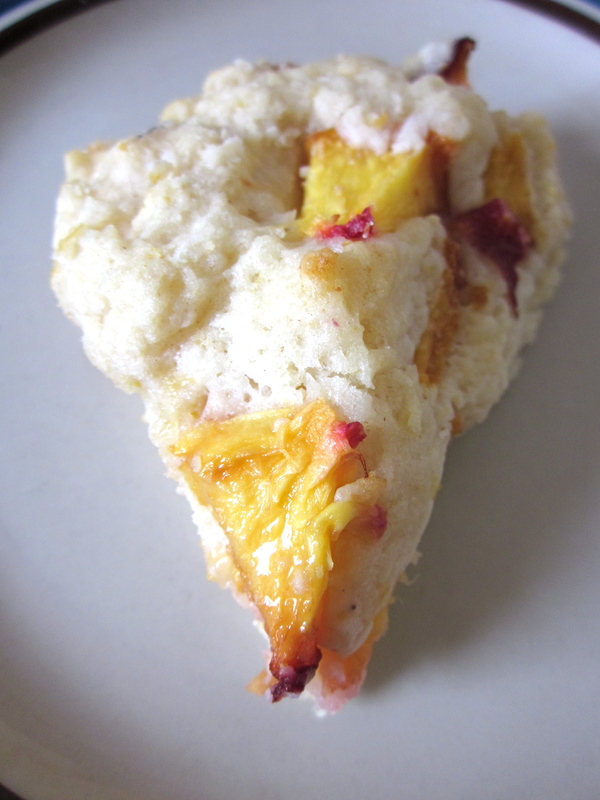 Distribute the pear halves over the crust. Sprinkle the reserved dough mix evenly over the top. Bake at 375 F for 15 minutes. Whisk together the egg and whipping cream (or in my case, evaporated milk). After the first baking phase is finished, pour the custard over the pears and continue to bake until the top is golden and the custard is set, 25-30 minutes. 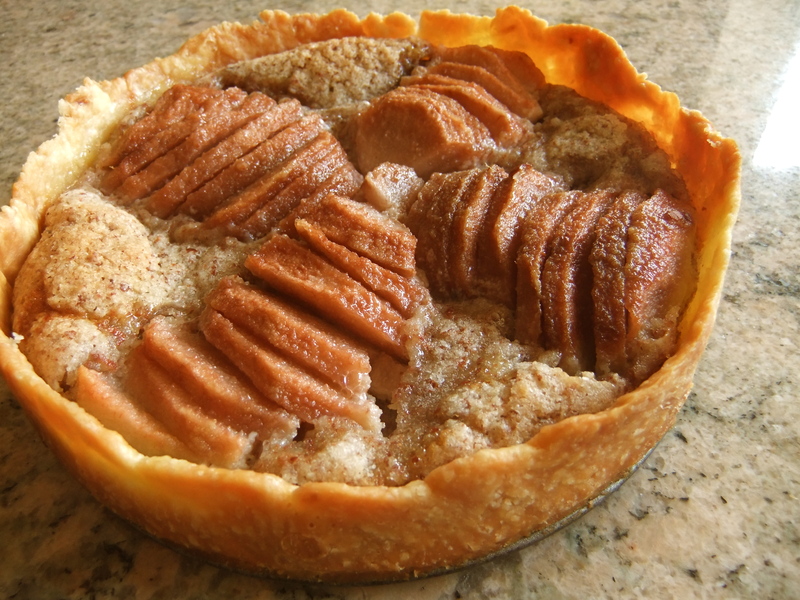 I wish I had the energy to write a better post about this cute tart. My mind, however, is consumed with too many things right now, leaving little room for more creative prose. 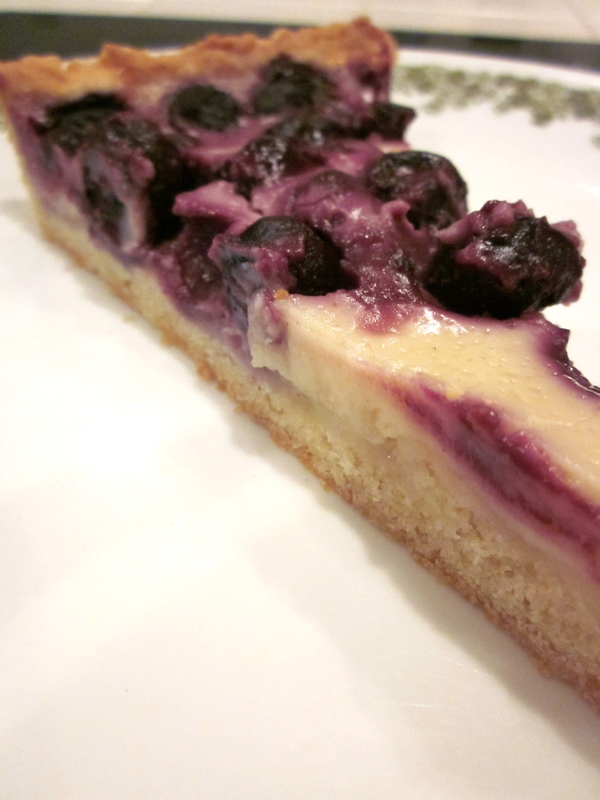 The blueberry flan filling is fresh and light from the yogurt and lemon zest. And 3 cups of blueberries? Oh, yes! 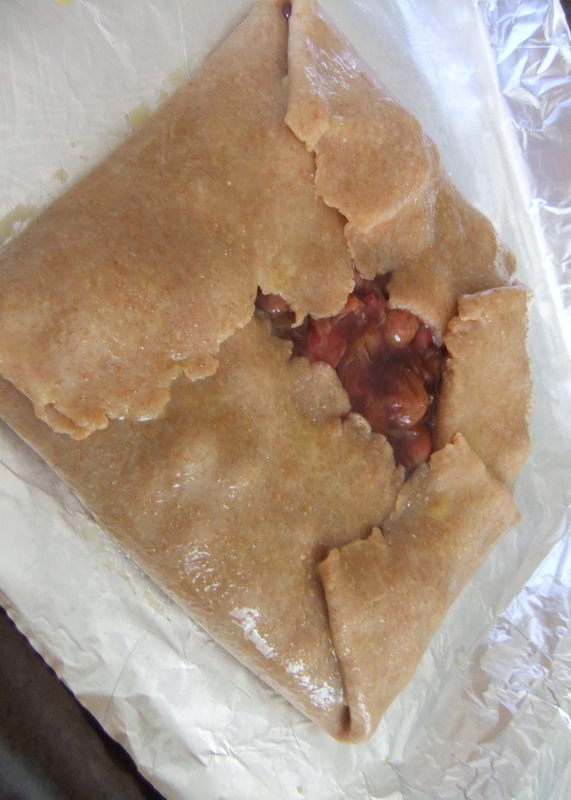 As for the crust, though I liked it, it wasn’t as good as my favorite sweet tart dough recipe from TipTopf. 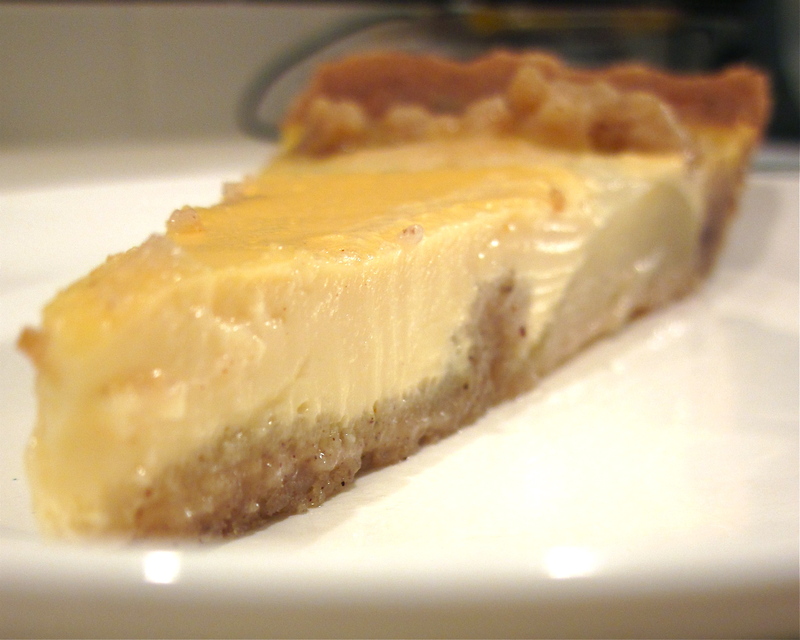 In bowl or with a food processor, combine crust ingredients until well mixed. Refrigerate for 30 minutes. 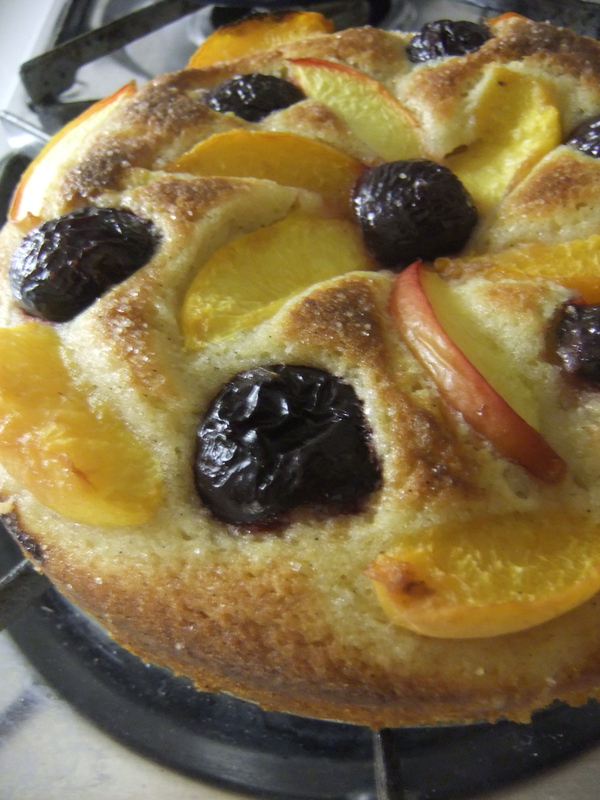 Press doug somewhat firmly into a large (10″ or about 25 cm) cake tin or springform pan. Whisk or process together the filling ingredients until very smooth. Set aside. 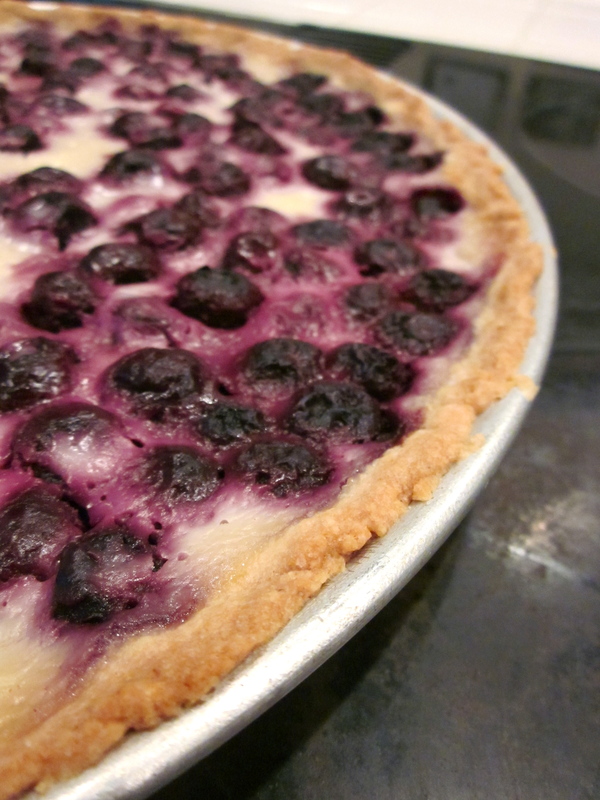 Sprinkle blueberries over top of the crust. Pour prepared filling over blueberries. Oregon. Winter is cold and rainy. Spring? Fall? Yup, cold and rainy. But summer, oh, summer–mildly hot, dry, and sunny, they are seriously the best. All you want to do is be outside, hiking, biking and swimming. And when you’re not doing that, you’re popping u-pick berries into your mouth and eating the sweetest peaches, plums and cherries, their juices dribbling down your chin. 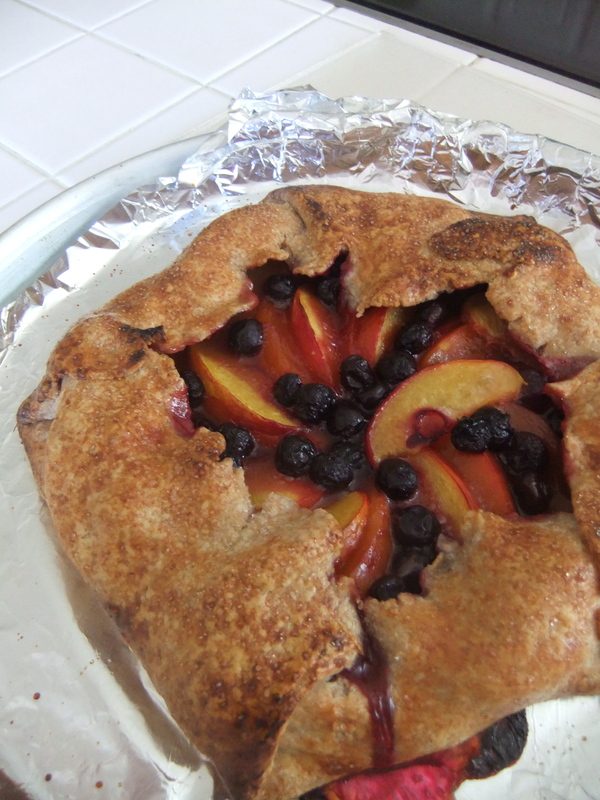 I ended up making two galettes, each with a different filling (blueberry-nectarine and red grape), and relied on two recipes, one for the crust and blueberry-nectarine filling (via In Erika’s Kitchen) and one for the grape filling (via Mac and Cheese). 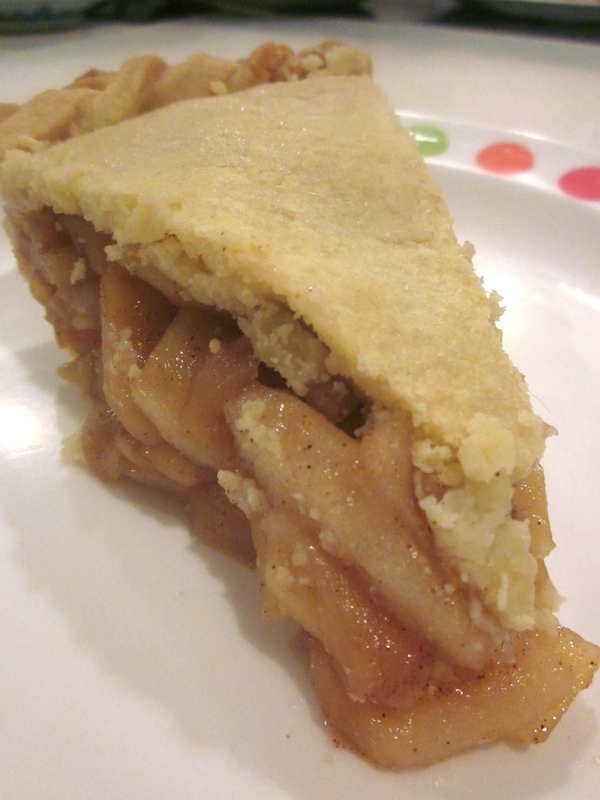 As for changes, for the crust, instead of using only all-purpose flour, I used half whole-wheat and half all-purpose. For the grape filling, I used lime zest instead of lemon (didn’t have any lemons at home). 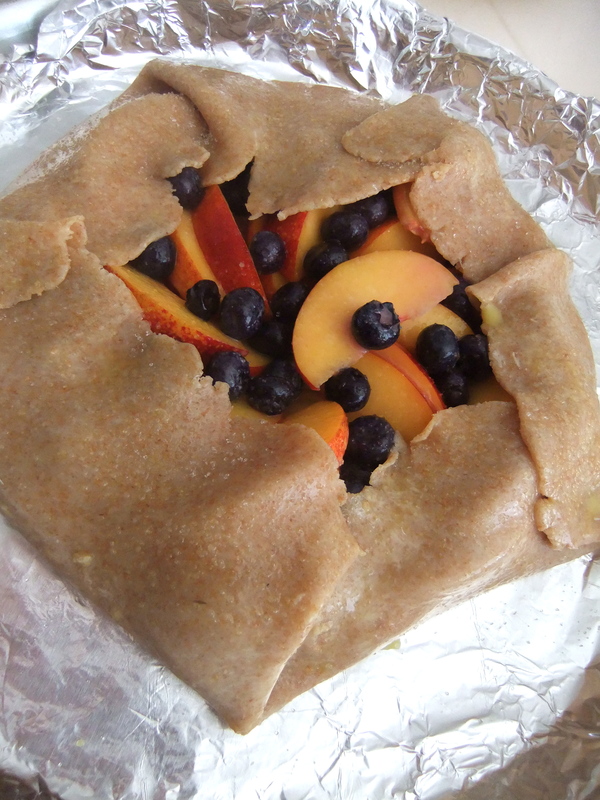 Oh my goodness, there are no words to describe just how delicious each galette turned out. 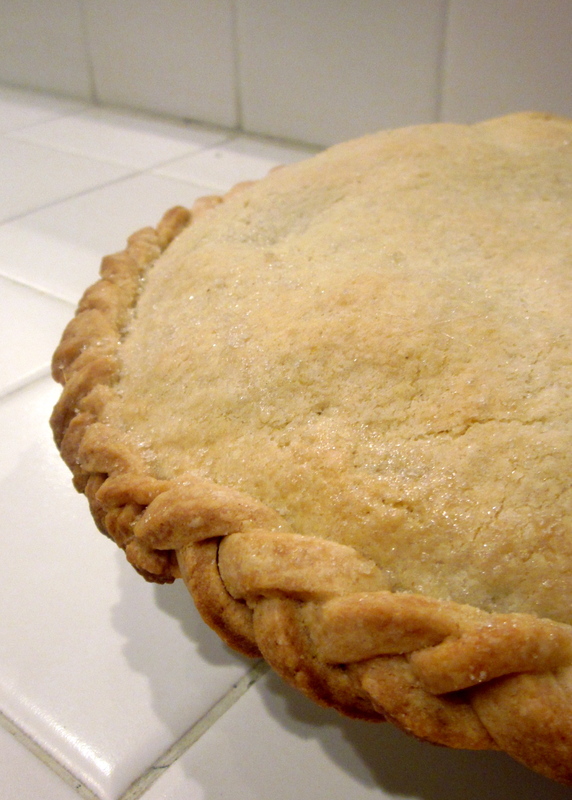 The crust was flaky, soft and so buttery. And the fillings—both amazing. I’d have to say I preferred the grape over the nectarine. Just a personal preference thing, I think. Make this, make this, make this. And then tell me how it all turns out! Sprinkle over about 1/4 cup of ice water and pulse again in your food processor is such that when you pinch some in your fingers it holds together. If necessary, continue adding small amounts of ice water and pulsing until it does this. 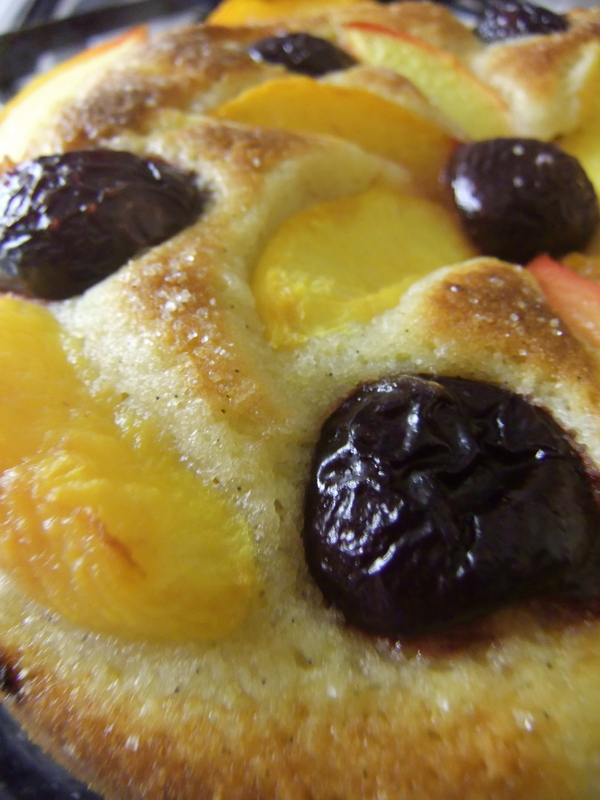 (If doing by hand, form a small well in the flour-butter mixture and pour in the water. With a fork, gradually work the dry ingredients into the water. Then, with your hands, very briefly knead until a dough just begins to form.) Turn the dough out onto the counter, divide in half and shape into two disks. Wrap the disks in plastic wrap and refrigerate for at least an hour. 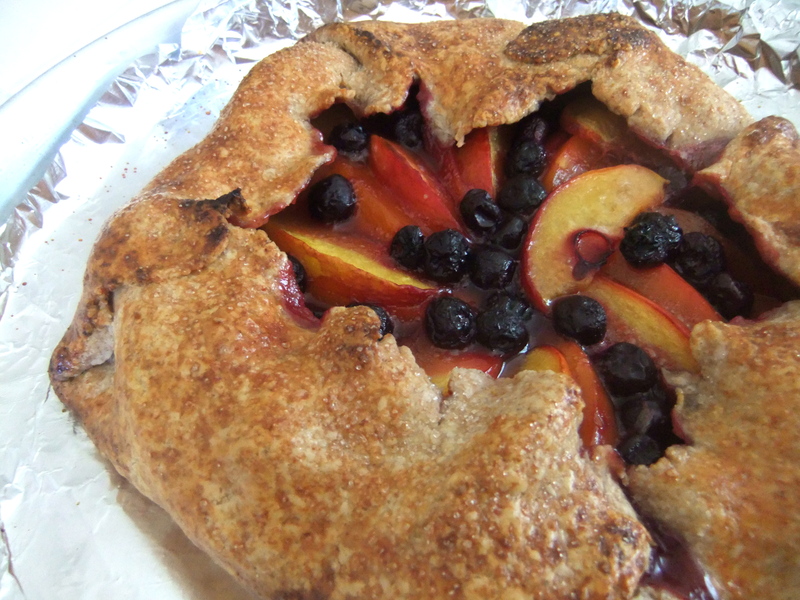 Blueberry-Nectarine: Put the prepared blueberries and nectarines in a mixing bowl with 1/4 cup of the raw sugar and the cornstarch, and mix thoroughly. 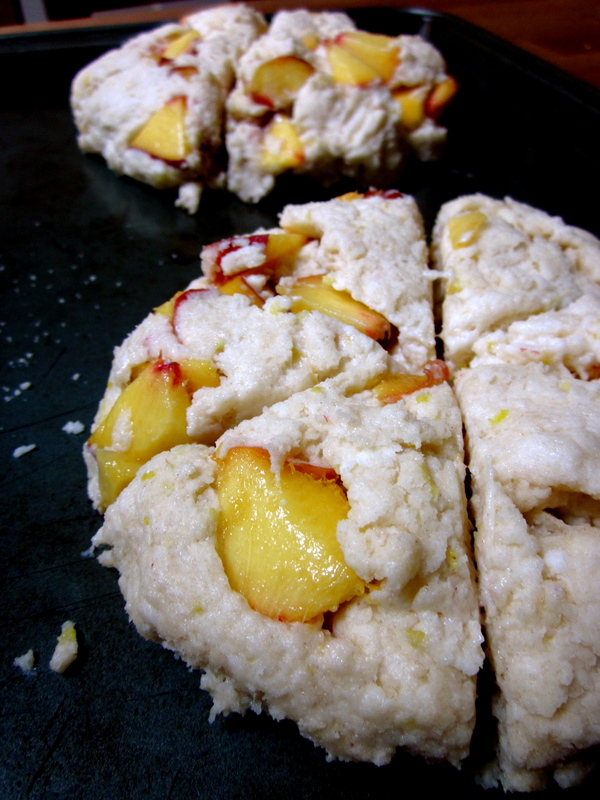 Let them sit in the sugar-cornstarch mixture at room temperature while the dough is chilling. This will help the fruit juice flow once you get the pie in the oven. Grape: Crush 3/4 cup of the grapes in a saucepan. Add remaining grapes, sugar, lemon zest, salt, and cornstarch to the crushed grapes. 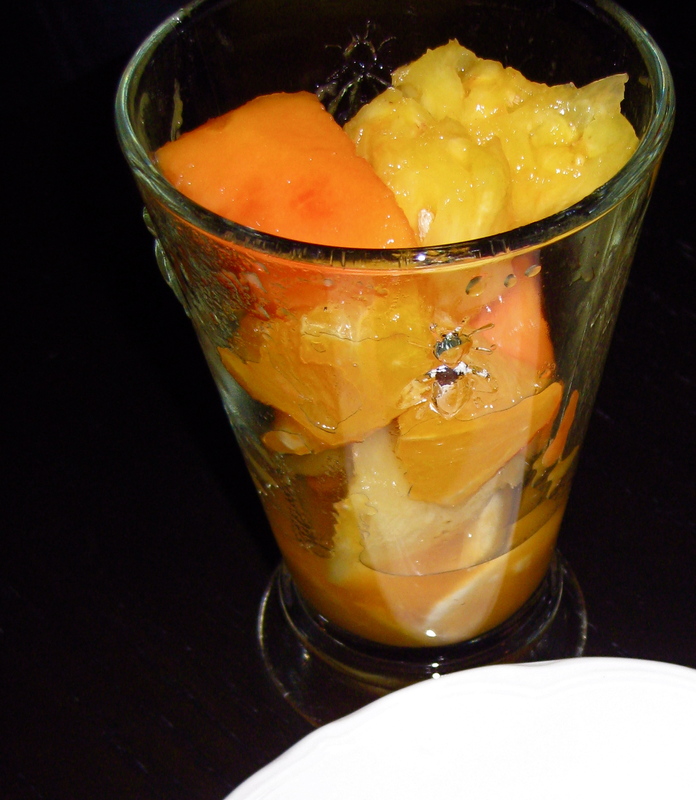 Heat fruit on stove, stirring occasionally until the juice has thickened. Allow to cool. 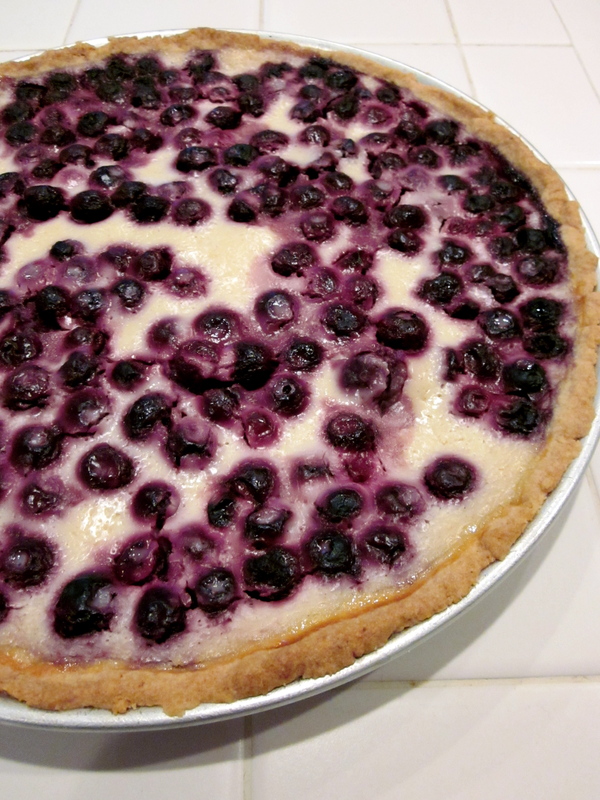 Remove from the oven and allow to cool at least 30 minutes before slicing. I can’t explain why, but lately I just feel like celebrating—celebrating Spring, family, and my peaceful life. And I have chosen to show my gratitude the best way I know how: by baking. This may look complicated to make, but really it isn’t. I was pleasantly surprised at how uncomplicated it actually was to put everything together. 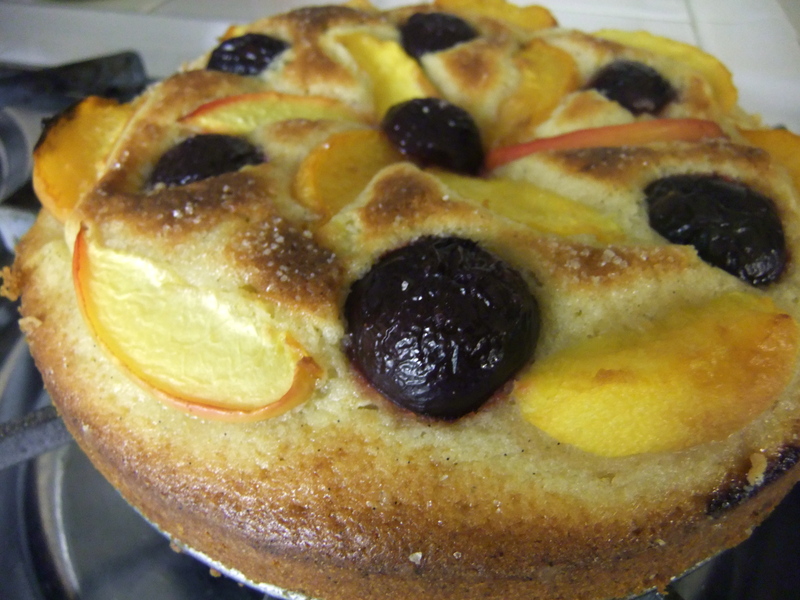 The only adjustment I made to the recipe was to use a sweet pastry dough recipe from my Swiss TipTopf cookbook. The thing I love most about this dough is that I can do it by hand. Maybe it’s just me, but I love the feeling of cold butter and flour rubbing between my fingertips. For once, it’s actually a good thing to have cold hands (besides the whole “cold hands, warm heart” thing :P)—the butter doesn’t melt when I mix it into the flour. Apart from the dough, I followed everything Dorie said to do. You know, it really does pay off to the follow directions and to measure exactly (and I was exact down to the gram). I don’t know why my pears are so brown. I’m not too upset about it because the taste more than made up for the slightly odd appearance. The golden crust is flaky and crisp, the pears are tender (but not mushy) and the almond cream—infused with sweet pear juice—is so incredibly smoooooth. So will I be making this again? Oh, yes! What a way to celebrate all the good things in life! 3 tbsp unsalted butter, at room temp. In a medium mixing bowl, whisk together flour and salt. Add the butter and with your fingertips, gently rub flour and butter together until evenly combined. Mix in the sugar and grated lemon zest. While the dough is chilling, pre-heat the oven to 428 F (220 C). Fit a piece of tin foil tightly against the dough. Bake for 15-20 minutes on the center rack. Once finished baking, carefully remove the foil. 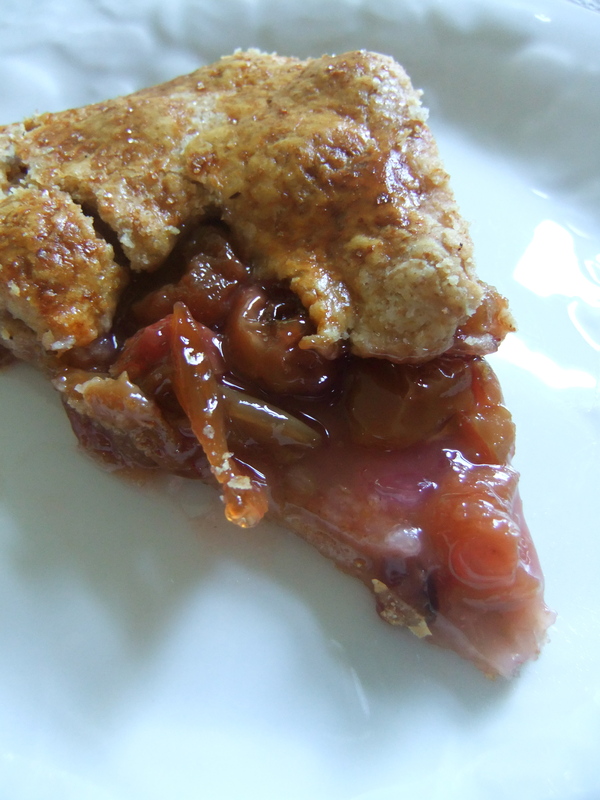 If the crust has puffed up, use the back of a spoon to gently push it back down. Put the butter and sugar in the workbowl of a food processor and process until the mixture is smooth and satiny. Add the ground almonds and continue to process until well blended. Add the flour and cornstarch, process, and then add the egg. Process for about 15 seconds more, or until the almond cream is homogeneous. Add the rum or vanilla and process just to blend. If you prefer, you can make the cream in a mixer fitted with the whisk attachment or in a bowl with a rubber spatula. In either case, the ingredients are added in the same order. Scrape the almond cream into a container and either use it immediately or refrigerate it until firm, about 2 hours. Center a rack in the oven and preheat the oven to 350 degrees F. Have a lined baking sheet at the ready. If you are using fresh (unpoached) pears, peel them now. If you are using poached or unpoached pears, cut them in half from blossom to stem and core them; rub the unpoached pears with lemon juice. Whatever pears you have, make sure to pat them dry – really dry – so that their liquid won’t keep the almond cream from baking. 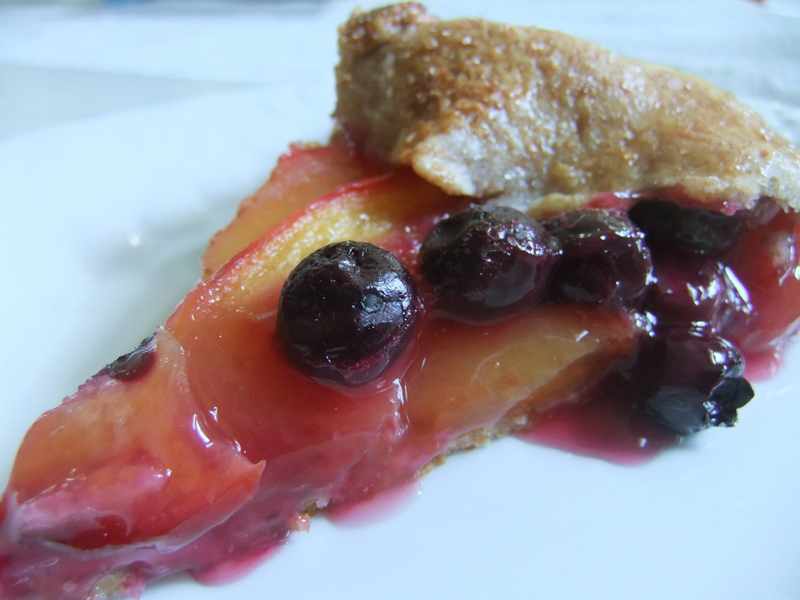 Fill the baked crust with the almond cream, spreading it even with an offset metal icing spatula. 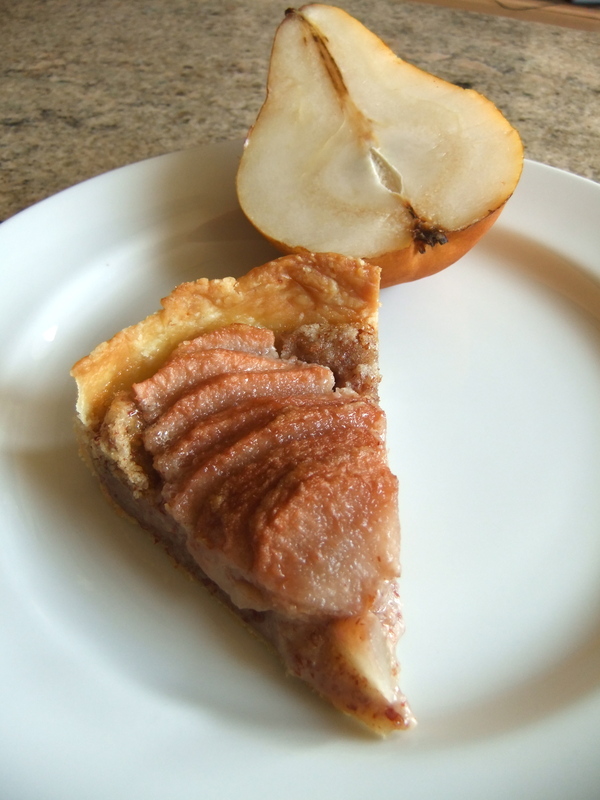 Thinly slice each pear half crosswise, lift each half on a spatula, press down on the pear to fan it slightly and place it, wide-end toward the edge of the crust, over the almond cream. The halves will form spokes.